When ordering a new wheelchair, ensuring that the wheelchair fits the physical requirements of its user is very important for health and safety reasons, but it can also effect mental health. Ordering a wheelchair is not a decision that should be taken lightly and it is important that the wheelchair user has plenty of input during the process. Once a wheelchair has been ordered, it should constantly be reevaluated to ensure that it is safely meeting the needs of its user. This should be done both the wheelchair user, as well as a doctor. Once a persons new wheelchair arrives, the prescribing doctor should evaluate the wheelchair to unsure that it is a proper fit for its user. There are a number of adjustments that can be made to the frame to fine-tune the wheelchair, so that the user can gain the maximum mechanical benefit from the wheelchair. For manual wheelchairs, since they require a good deal of upper body strength to use, the comfort of the arms in relation to the manual wheelchairs drive wheels is very important. This means, that when in the starting position, the users arms should basically be at rest. This will help to prevent cramps and reduce the effort required to use the wheelchair. The cushion and seat of the wheelchair should also be treated as a single unit, otherwise, you risk the user being too high or low when the cushion is added. Proper seat height is important, because if the wheelchair is too high, not only will it be uncomfortable, but it will also reduce the efficiency of the wheelchair, which makes it much harder to use. If the seat is too low, it can cause uneven weight distribution. The height of the backrest is also very important. If it is too high, it can restrict the movements of the shoulder and upper body. However, a backrest that is too low will not provide enough support and can result in poor posture. The overall width of the wheelchair is another important consideration, because a wheelchair that is too wide can result in the user developing poor posture. This is because the individual will have to lean side to side to reach the wheels. 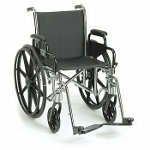 Of course, a wheelchair that is too narrow can cause discomfort and sores, so finding the correct median is essential. A seat that is too deep can also cause problems, as it can reduce circulation and attribute to poor posture. It can also be dangerous, because the weight of the user is not as evenly distributed, resulting in less weight on the thighs. One of the most popular, if not the most popular, mobility aids for seniors is the mobility scooter. Mobility scooters were first developed during the 1960′s and share many similarities with the electric wheelchair. An electric motor propels the mobility scooter and it uses one or more batteries, much like a power chair. Often they also share a similar, if not identical captains chair, which includes the same types of features, such as a reclining back, electric lifting system, and swivel controls to make exiting the mobility vehicle much easier. Like the other two kinds of mobility vehicles, mobility scooters also feature anti-tip casters to prevent the device from tipping over backwards. However, the physical design of a mobility scooter is actually much different than that of a wheelchair, both electric and manual. This is because they have a much longer wheel base and the captains chair is mounted on the rear of the base. Instead of an armrest mounted joystick, like is used on an electric wheelchair, a mobility scooter is controlled by a set of handlebars, which extends from the front of the scooters base. These handlebars, which are referred to as the tiller, can be adjusted to accommodate riders of different sizes. This allows the mobility scooter’s tiller to be brought closer or moved farther from the captains chair. Depending on the model of scooter, the tiller might have a headlight, turning signals, battery meters, keyed entry, and troubleshooting gauges on it. Due to the location of the tiller, a mobility scooter can not be driven directly up to a table or desk. There are a number of different types of mobility scooters available, with many different models available. There are also several ways that an electric mobility scooter can be classified. One of the most common ways to classify a mobility scooter is by the number of wheels it has. 4 wheeled mobility scooters have two wheels in front and two wheels in the rear. This provides more stability, because as in the case of a rear wheel drive power chair, the weight of the occupant is spread out more evenly. This makes a 4 wheeled scooter more stable than a 3 wheeled scooter. While a three wheeled mobility scooter might not be as stable as a four wheeled scooter, they are typically much more manuverable and have a turning radius that is considerably smaller than that of a four wheeled scooter. This makes a 3 wheeled scooter preferrable for indoor use. They are also typically lighter in weight. The other way that mobility scooters are classified is by their intended use. For example, there are travel scooters, heavy duty scooters, and traditional scooters. Travel scooters are designed to be as light weight as possible, so they can be taken on vacation or away from the home. They are also designed so that they can be easily disassembled, with all of the pieces being a manageable weight. Often the heaviest piece weighs less than 30 pounds, so most people are able to disassemble it and place it in the trunk of their car or rear seat of their vehicle. Most travel scooters are three wheeled, as this helps reduce the overall weight of the electric scooter. They also have fewer features, like a scaled back captains chair and no running lights, to further save weight. Travel scooters do not have the same weight support or range that you could expect from other scooters, but for vacation they can be a great choice. On the opposite side of the spectrum you have heavy duty scooters. A heavy duty mobility scooter is designed to be as rugged and durable as possible. They have the highest weight support, usually feature reinforced bumpers, larger tires, and are packed with features. They are designed, as the name implies, to be used over rough outdoor terrain. Typically, most are four wheeled as this provides the most stability, but there are a few three wheeled heavy duty scooters. Heavy duty scooters also usually have a very high top speed, large per charge range, and can be a great deal of fun to drive. While great for outdoor use, since a heavy duty scooter is typically much larger than other electric scooters, it can not be used in some indoor situations and has a much larger turning radius. It also weighs a great deal more so taking it apart and placing it in a vehicle might not be an option for most people. Heavy duty electric scooters are also the most expensive type of mobility scooter. All other mobility scooters fall into the category of traditional scooter. These come in a variety of sizes and while they have many more features than a travel scooter, they have fewer than a heavy duty scooter. Typically though, they will have things like running lights. They come in either 3 wheeled or 4 wheeled designs. When compared to travel scooters, traditional scooters offer increased weight support, range, top speed, stability, and durability. Like heavy duty scooters, the weight of a traditional scooter often makes disassembling it not an option, because the lightest piece can often weigh well over 70 pounds. Price wise the cost of a mobility scooter usually falls in the middle, between a manual wheelchair and electric wheelchair. 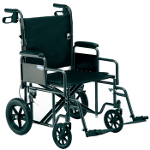 They are easy to use and have a greet range, so can be a good choice for a senior who has difficulty walking. Due to the location of the tiller, you are not able to drive a mobility scooter directly up to a table, which means that some mobility is required of the user in order to get the most benefit out of a mobility scooter. For someone who can walk, but not for extended periods of time, a mobility scooter would be a good choice. However, for someone who can not walk, a mobility scooter might not be a good choice. 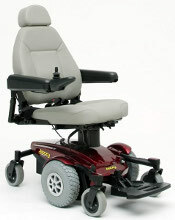 The electric wheelchair is today very popular and has been around since the early 1950′s. Early electric wheelchairs simply used the frame of a manual wheelchair and added an electric motor to it. Unlike manual wheelchairs, which require a great deal of upper body strength to use, electric wheelchairs require virtually no effort on the part of the user. 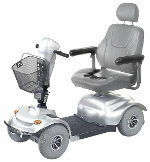 They are also often referred to as power chairs or electric power chairs. Today, some models are still available that use a traditional manual wheelchair design, but most make use of a molded plastic base, which contains the electric motor. One or more batteries is also contained in the base of the electric wheelchair, which allows it to be used over great distances. The range and top speed of an electric wheelchair varies by model, but most are able to at least travel 5 miles on a single charge and at speeds of around 4 mph. The weight capacity of electric wheelchairs varies by model, but 250 pounds is almost an industry standard. The chair of the electric wheelchair in some regards resembles an office chair, with a high back and armrests on either side. It includes a good deal of padding and can be reclined. It also usually swivels to the left or right, allowing for the power chair to be exited in a safe manner. The chair, which is often called the Captain’s Chair, usually has foldable armrests to further facilitate smooth transfers into and out of the chair. Some even have an electrical lifting system, which raises and lowers the chair. This can be important if, for example, using a table that is higher than normal. Most power chairs use a joystick control that is mounted to the armrest of the chair. This design is the same used on the first electric wheelchairs and can be configured for use on the left or right side of the power chair. There are also a number of alternate controls available for those who are not able to operate the joystick. Perhaps the most common alternate wheelchair control allows the wheelchair to be controlled by the users breath. Blowing into the wheelchair moves it forward and breathing in moves it backwards. The direction of the wheelchair can also be controlled. There are a number of other alternate controls, including a remote control that can be operated by a caretaker. If you want to transport a traditional power chair, it is usually necessary to use a wheelchair lift. However, portable power chairs are available, which are lightweight and can be folded to take up less space. 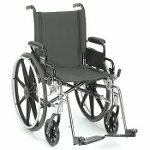 These models closely resemble a manual wheelchair, with a steel or aluminum frame and cloth seat. However, they still weigh a great deal more than a manual wheelchair would. 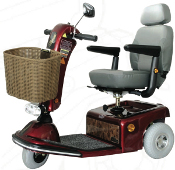 The motor and battery is installed under the seat and while these units often do not have as far of a range as other power chairs, they are easier to transport. 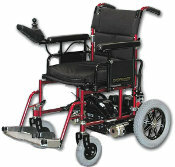 Today, there are a number of different types of wheelchairs available. There are literally hundreds of different features and designs that are available to help fit the needs of wheelchair users. For the new wheelchair user, choosing the right wheelchair can often be a very difficult and confusing task. Usually when an individual gets their first wheelchair, they do not know a lot about how wheelchairs work and what features will fit their needs. Often, a doctor will prescribe a wheelchair as part of their treatment and then take measurements of the individual to determine what type of wheelchair to order. There are actually a number of problems that can arise from this process, but they typically are caused by the patients own lack of knowledge of wheelchairs and the fact that the doctor is not a wheelchair user. Since many doctors have never actually used a wheelchair for an extended period of time, through no fault of their own, they might not be the best resource for fitting an individual to a wheelchair. The patient, who is also inexperienced in wheelchairs, turns to the doctor as an expert on wheelchairs, but this is not going to always be the case. Instead, the doctors experience with wheelchairs is often limited to a few days of training during college, so they measure the patient and plug the numbers into a worksheet to determine the proper dimensions. As a result, the wheelchair prescribed might not fit the best needs of the patient. This is, of course, not to say that all doctors are poorly, have an ill intentions, or are not a good source of information. However, it is important to understand that since the doctor or specialists has probably never used a wheelchair for an extended period of time, they are not always as knowledgeable about the subject as a person might think. To help deal with these challenges, there are a number of things the wheelchair user can do. First and foremost, it is a good idea to do some research about wheelchairs. This can involve reading articles about wheelchairs, but it is highly recommended to also talk with someone else who uses a wheelchair, because they offer a wealth of information. Another great source of information is actually wheelchair salesman. They quite often know a great deal about wheelchairs and can be a great resource. However, since they are a salesman, it is imperative to remember they want to sell you a wheelchair and so, might not provide you a completely objective view. Instead, they will likely only mention products they offer, so it is very important to take what they say with a grain of salt. One of the major parts of determining what type of wheelchair is best, will revolve around where the wheelchair will be used and the physical abilities of the rider. Since manual wheelchairs can be very strenuous, someone with very limited mobility might not be able to successfully use it, the physical abilities of the wheelchair user will be one of the most important considerations. There are also a number of features and adjustments that can be made to the wheelchair to make it more comfortable and usable. For instance, some manual wheelchairs do not have armrests, which can make it more maneuverable, less strenuous on the arms, and easier to move under a table. Others have lowered backs, which make turning around in the wheelchair easier, or are designed to move much faster than traditional wheelchairs. This can be one area where an existing wheelchair user can offer excellent insight, but remember that some of these factors will come down to personal preference. Understanding the options available and doing a good bit of research, can make finding the right wheelchair much easier. For the wheelchair user, being involved in the wheelchair selection is imperative and one of the most important things they can do, because when a wheelchair is prescribed strictly by the books and without input from the patient, it will not always fully meet their needs.